Sualkuchi Institute of Fashion Technology. 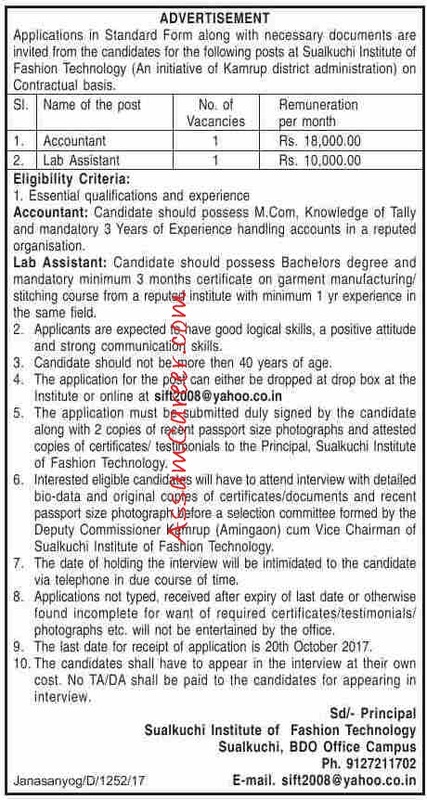 Applications in standard form along with necessary documents are invited from the candidates for the following posts at Sualkuchi Institute of Fashion Technology (An initiative of Kamrup district administration) on contract basis. Educational Qualification: M.Com and knowledge of Tally and mandatory 3 years of experience handling accounts in a reputed organization. Educational Qualification: Bachelor degree and mandatory minimum 3 months certificate on garment manufacturing/ stitching course from a reputed institute with minimum 1 year experience in the same field.